Jumping Jehoshaphat! It’s a jeofail! The law was approved on the 24th of January 1839. It was one of the first passed by the First Session of the Legislative Assembly, held at Burlington, in what was then the Territory of Iowa. Right. Sure. Anything you say. I mean, seriously, even The Legal Genealogist — a genealogist with a law degree! 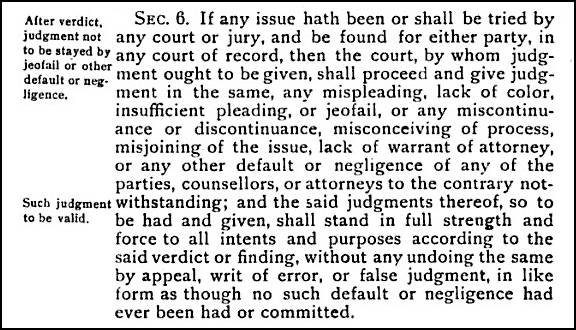 — had never ever before even heard of the word “jeofails,” much less seen it used in a statute. So, of course, I did what any self-respecting genealogist with a law degree would do. Aha! Light begins to dawn. 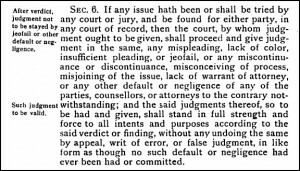 So if you ever run across this, in an old court record or, as here, in a statute book, here in plain English is what’s going on. But sometimes nobody figured out that the way you wrote your pleading wasn’t exactly right until the case was well underway — and sometimes not even until the case was completely finished. And, you can imagine, sometimes a canny lawyer would figure out that the other side had blown it somehow and would sit back and wait to see if he lost the case. Then if he did lose, he’d pounce by revealing the pleading problem then. That was the “jeofail.” And, strictly speaking, a judge confronted with that technical problem in the paperwork wasn’t supposed to wrap up the case by entering judgment for the winning side. Unless, of course, the law said he could… and the way the law said he could was a law exactly like the one Iowa passed at its very first territorial legislative session — authorizing its judges to go ahead and enter the judgment for the party who won at trial and telling its appeals courts not to overturn a judgment on appeal just because of some technical problem with the paperwork. So if you run across the word “jeofail,” now you know what it means. And why it mattered. And what the law did to fix it. This is great! I shall incorporate the word jeofail into my vocabulary! Isn’t it a fun word? I believe it’s pronounced JEFF-ail. Oh the places you go, Judy! From old French… Whew! My brain buzzes with how to use this word now. I can see that the past with my 4 challenging teenagers would have been a great time to use it! You can always casually drop it into conversation today, Celia! Oh, dear. I was afraid that the paragraph of legal terminology meant what you said it did: “Too late now.” I wonder how many places/states have laws like this one. On TV, they’re always claiming “mistrial” in retrospect. I think. Just about every place has this kind of rule, Mariann, because it really only addresses these very esoteric technicalities of pleading. What you see on TV are dramatizations of the more usual complaints about actual trial errors.